Crews worked Friday night and power restoration is continuing Saturday from wind storm damage. Crews worked through the night but continued high winds Friday led to additional, severe storm damage and the cooperative expects power restoration will continue well into Saturday. 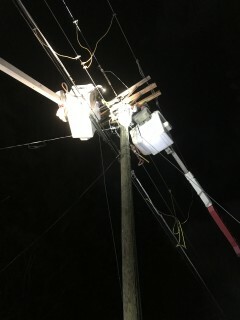 Blue Ridge Energy crews are working in full force with assisting crews from South Carolina’s Blue Ridge Electric and contractor Sumter Utilities. Alleghany County and a portion of Wilkes County near Alleghany and Ashe county lines are hardest hit by wind toppling trees and tearing down electric system along with it. Crews are working as quickly and safely as possible as they chain saw their way into some locations where trucks are unable to access to repair mangled power lines and replace broken power poles. Alleghany District: 185 members primarily in the areas of Mahogany Rock Rd., BrineGar Lane, LilyPad Lane, Pendry Rd., Saddle Mountain Church Rd., Clark Hop Rd., Lonmack Rd., Meadow View Rd. During the height of the storm damage, over 5,000 members in western Watauga County were impacted by a large voltage transmission outage. The area of damage was the cooperative’s most difficult to reach transmission line, in a very mountainous ridge-top line crews had to access by all-terrain vehicle. Line technicians manually scaled the large transmission line, hooking ladders to reach the top to make repairs and restore power before midnight.